Abyss Freediving club is the most active PADI Freediving Club in Sydney. By joining the Abyss Freediving Club members receive. • Freediving Training orientation session. • Access to the twice-weekly training sessions. (Tuesday evening, & Sunday morning). • Free freedive local shore events. The Abyss Freediving Club meets at San Souci Leisure Centre (521 Rocky Point Rd, Sans Souci NSW 2219) every Tuesday evening from 6:30 pm until 8:00 pm and every Sunday from 7:00 am until 8:30 am. The pool has plenty of free parking and club members get free entry. Non-club members are welcome to come along to the Freediver Pool Training sessions but there is an induction fee of $35 and then a fee of $35 per session paid to Abyss Scuba Diving. We have the exclusive use of an indoor heated 25m lane specific for Freediver Training. Please note that due to this specific window of time, sessions will start promptly. We recommend arriving 30 mins early to get changed, stretch and prepare yourself for the session. If you are running late, we will simply have to start without you and you won’t get the maximum out of the training. Training will focus on Pool Disciplines STA (Static Apnea) DYN (Dynamic Apnea) and DNF (Dynamic Apnea No Fins). We will alternate training sessions depending on the day and what is most appropriate. This gives everyone an opportunity to develop in areas that they feel comfortable with and enjoy. 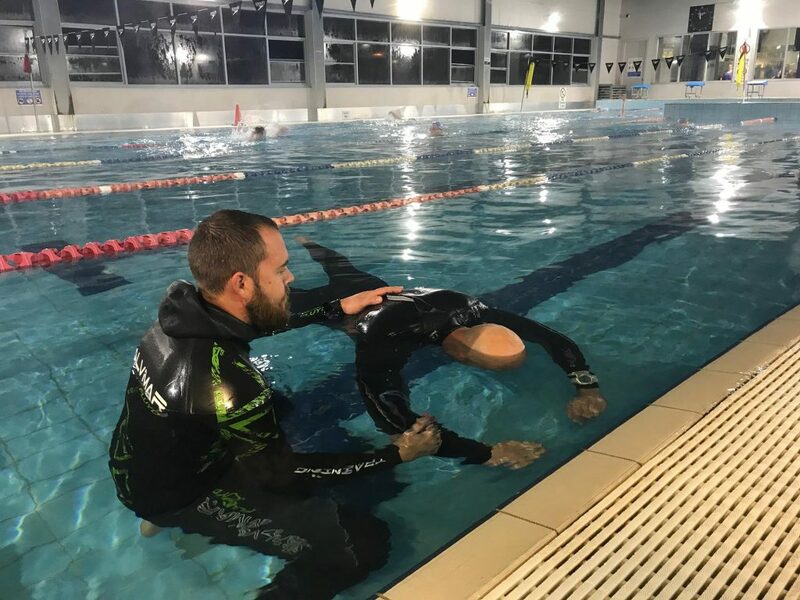 An experienced PADI Freediving Instructor will be there to assist in running the sessions, keeping a good eye on safety protocols and to provide informal technique workshops. The instructor is not there, however, to be your personal coach. They are there to assist everyone taking part in the training. Please be aware of this. If you are interested in working one on one with an experienced Freediving Instructor, you can book personal freediving coaching sessions for $150.